| Interview by Daniel Codella conducted on June 8, 2011. Almost every musician dreams of releasing songs, getting noticed by a major record label, and having a #1 hit, but few ever experience it. Adam Young, a.k.a. "Owl City" had his dreams come true when songs he posted on his Myspace page earned him a massive following and the attention of the major record labels. Signing to Universal Republic in 2008, Adam released "Ocean Eyes" which contained the hit triple platinum single "Fireflies." Adam's tracks are intricate labyrinths of electronic textures, catchy guitar riffs, and upbeat vocals. 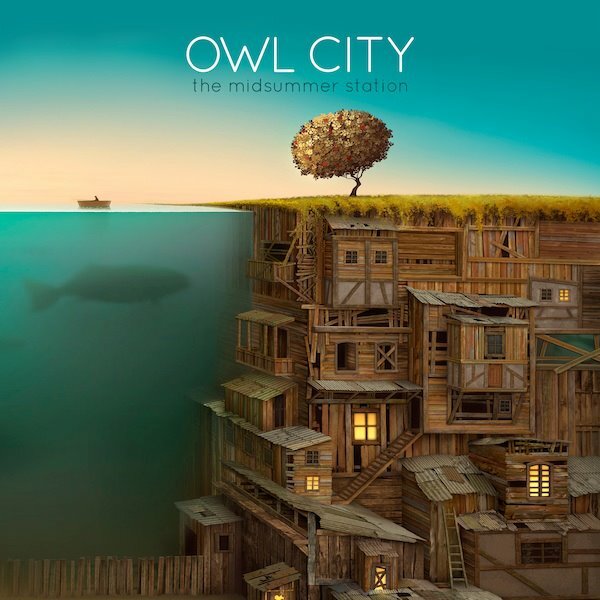 Owl City is about to release the follow up to "Ocean Eyes," the new album, "All Things Bright and Beautiful" on June 14th, 2011. Judging from Adam's past work, it sounds like his new album with definitely live up to its name. Adam took time out of his schedule to drop us an email about how he formed Owl City, explain what his new album sounds like, and tell us how much he's been enjoying the Discrete Drums series. What first inspired you to make music? Do you come from a musical family? I'm actually an only child and neither of my parents played instruments so music was always an exciting thing to me because of the fact that it was so foreign. I started making music in my basement out of boredom and after a friend let me borrow a sequencing software program, I couldn't stay away from the world of music production. Beyond the fact that it's just so fun, I really enjoy letting my imagination take inspirations for new songs and running with them. Were you surprised by the attention your music got on Myspace? Very surprised. I never imagined anything happening with my music and an actual career as an artist was so far out of reach, I never really gave it much thought. But for whatever reason, a few early demos started resonating with people and suddenly record labels were calling me and everyone was interested in the project. It really is a dream come true for me. Is there any special significance behind the name "Owl City?" The name itself is purely designed to create imagery and spark the imagination. A name like "Owl City" seems to mean a lot of things to different people and I always enjoy hearing other peoples' interpretation of it. I wanted a name that would immediately trigger the imagination and as bizarre as it may seem, I'm happy with it. How would you say your new album, "All Things Bright and Beautiful" differs from "Ocean Eyes?" To my ears, it sounds a lot bigger, more polished and ultimately "older and wiser" than Ocean Eyes. I always forget how much work it takes to make a record for one guy alone in a studio but it was a great challenge and I loved every minute of the process. The new album sounds a lot more "resolved" to me... a lot more "finished" in a sense. I'm really happy with the next chapter in the Owl City story. A while back you received some Discrete Drums sample content, what did you think of the sounds? Did any find their way into your demos/final productions? If not, do you think you'll be using them in future productions/remixes? I loved the sounds! I was really into them and though I haven't found time to use them in recent productions, I definitely plan to use them in future mixes! The samples sound very organic and real which mean I don't have to spend as many hours pouring through libraries of cheap sounding drum samples because the sound is AMAZING right out of the box! What can people expect from a live Owl City performance? Lots of dynamism, lots of up and downs, lots of progressive movements and ultimately the same sense of uplifting optimism that comes through on the album. Where can our users hear more of your music and learn more about Owl City? The new record comes out June 14th in stores everywhere! You can also visit www.owlcity.com for all the latest news and tour dates. "The (Discrete Drums) samples sound very organic and real which means I don't have to spend as many hours pouring through libraries of cheap sounding drum samples because the sound is AMAZING right out of the box!"